No sooner we showered our bodies of the smoky Korean BBQ remnants back at the hotel, we hopped in a cab and hauled it to Itaewon for the party scene. We got dropped off in the midst of it all. Bars, clubs, karaoke, etc. From the street level, we saw a balcony filled with people and loud music playing. We went inside to discover it was one group of people sitting at a long table having dinner and the rest of the bar was empty. Not a soul to be found. We quickly found this to be the theme of the night. Where are all the Seoulful people on this Wednesday night?? As we walked down the strip of bars, it seemed the louder the music blasted outside, the emptier it was inside. We finally settled at a lounge called S2 for some soju and beer. Soju is a Korean spirit made from sweet potatoes. I find it a mix between sake and vodka. 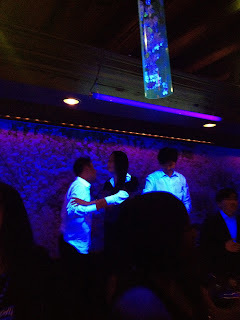 Down one bottle of soju and a round of beers, we moved on to an Irish pub, then took another taxi to the Grand Hyatt. We heard about the nightly live music at the upscale hotel, and that’s exactly what we found. The drinks were expensive, but we stayed for a round because this was by far the most popular bar of the night. The American band was set up on a small stage behind the main bar, covering top 40 pop music. The crowd was a mixture of Americans and Koreans. Overall, the people were either grinding up on each other after a few too many cocktails, smoking, dancing on couches, or singing along with the music. This is the kind of action I like to watch. When the band called it a night, so did we. 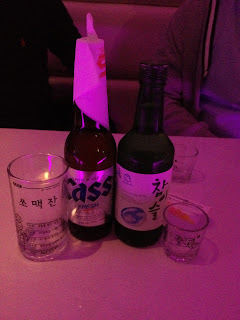 We left the Grand Hyatt and took to the streets of Itaewon for some more soju. At the convenience store, it costs $1.50 per bottle, which is about the size of a beer bottle. We drank some out on the street while soaking in the culture of Seoul nightlife. A few homeless people, groups of friends bar hopping, butch ‘women’ sitting on stoops underneath signs that read ‘Trans’. We weren’t exactly model American tourists at this point, seeing as we were drinking on the street, but there was clearly more action out there than in the bars. After we finished our people-watching and soju-sipping, we got some snacks and called it a night.